Welcome to Dru's Cozy Report. I will be sharing, on a monthly basis, my views on current cozy mysteries. In this inaugural post, you will find three books that I recently read and my thoughts about them. Glitz and glamour are de rigueur at this year's dog show, and Ellie's soaking it all in as the guest of a client. But before the dogs and handlers can take their bows—and wows—one handler dies. So Ellie is asked to fill in and lead Lulu, one of her dog-walking charges, to victory. When the death starts to look like foul play, Ellie's sometime boyfriend, Detective Sam Ryder, gets assigned to the case. As she's getting the hang of handling, Ellie tries to help find out who hated Lulu's former handler. But now the killer might have it out for Ellie, and she and Sam will have to dig up the truth faster than a speeding bulldog. Wouldn't everyone like to know what their furry friends have to say? Ellie has that with her dog, Rudy, and her charges. Ellie is invited to get a backstage look at a dog show and by days' end; she is the new dog handler. When her friend becomes the prime suspect, Ellie starts to investigate, against the wishes of her detective boyfriend. The conversations between Ellie and her pooches are humorous and I love when she hides their talking from the humans. What I like about this book was I knew who wasn't the killer until that aha moment when the killer was clear to me. I love that in a mystery. Make no bones about it, this was a fun-filled mystery. FTC Full Disclosure - I bought my copy of "Death in Show"
India Hayes is a lot of things...but she's about to step into the most challenging role of her life: amateur sleuth. Childhood friend and now knockout beauty Olivia Blocken is back in town to wed her bodybuilder fiancé with India as reluctant attendant because she's betraying her brother. Mark still carries a torch for the bride who once broke his heart and sent his life into a tailspin. When Olivia turns up dead and the evidence points to Mark, India must unmask the real culprit while juggling a furious and grieving Mother of the Bride, an annoyingly beautiful Maid of Honor, a set of hippie-generation parents, the police detective who once dated her sister and is showing a marked liking for her, and a provost itching to fire someone, anyone—maybe even a smart-mouthed librarian. India's investigation leads her on a journey through childhood memories that she'd much rather have left in the schoolyard, but to avoid becoming the next victim, it is a path she must follow. This is a good debut novel introducing college librarian India Veronica Hayes. While looking for evidence that will clear her brother, India has her hands full with peace activist parents, an overbearing sister, a quirky landlord, and a best friend. I love the tone and the setting of the story which felt very comfortable. I had an inkling of who the killer was and I enjoyed watching India go through the paces in search of the killer, which kept me turning the pages because I wanted to know the motive. This evenly spaced story with eccentric characters was a joy to read. You can make book that we will see more of India and her exploits. FTC Full Disclosure - I bought my copy of "Maid of Murder"
Madeira loves her vintage clothing store, but the visions she gets from the garments can be hard to handle, especially when she knows the garment's owner. At first she's thrilled to receive a package containing the beautifully bejeweled dress she designed for actress and old friend Dominique DeLong while in fashion school. But the dress comes with a disturbing note from Dominique, who it seems took her last bow under very mysterious circumstances. Now Maddie needs to use her second sight to shine a spotlight on the actress's entire entourage—including a bitter ex, a rival ingenue, and a very catty "best friend"—and make sure that this was the killer's final act. When Maddie’s vision suggests that her friend’s death was not what it appears to be, Maddie, Eve and friends head to New York and wherever Maddie and Eve goes, trouble follows. From *bereaved* relatives and jealous co-workers, Maddie is sure that one of them killed her friend and now she needs to find tangible proof. What I liked about this book was watching Maddie, an amateur sleuth, working together with the FBI and a police detective from the moment she suspected her friend was murdered. Okay, said FBI was her boy toy and the detective a good friend; it was just good to see it from the beginning. I love seeing snippets of the past come alive when Maddie touches or wear vintage clothing. The characters are all loveable in their own quirky and eccentric way and I look forward to my visits with them. Any book that embraces and makes me shed tears is a darn good read. This is an enchanting story that makes you believe. What fun. Hadn't heard of any of these books. Might have to give them a look. These all sounds like enjoyable books. I have to say I'm a huge fan of the 'Vintage Magic' mystery series. I've put off getting a copy because I had several books I 'had to read' and I knew I'd be tempted if I got Madeira's latest adventure. Enjoyed your cozy report Dru. Looking forward to the next. I haven't read any of these, but I will now. Thanks for the reviews! Loved your write-ups, Dru! All three sound great and will be added to my TBR pile. I've heard of these book, but haven't read much about them. Now that I've read your blog, I am definitely interested in reading them. Thanks. Oh, these all sounds like such fun reads!!! Thanks, Dru! They all sound like great fun. You are the Cozy Queen - and what a reader. Thanks for posting the great reviews. I recently purchased Maid of Murder, but haven't had a chance to read it yet. I will be adding the other two books to my list. I've read one of these, but the other two sound interesting, too! Thanks for the great reviews! Three new authors for me to try. Thanks, Dru. Looking forward to checking out three new authors. Great reviews, Dru! Well done, Dru! I look forward to more of your reviews. Thanks for the cozy reviews. I am happy that it will be a monthly feature here. I am espially looking forward to Death in Show. Leave it to Dru to not only find three promising reads, but write up a great post on all three. Good to see the Chicks have given the world's greatest reader a home, D! **waves to Dru** Hey honey, I am popping over here to see what you got cooking! Wonderful reviews honey!! I hope all is well and your enjoying your weekend!! Thanks for stopping by. Come back and visit next month, same day, same blog. #2 and #3 both look highly appealing. Adding to the Wanton Wantin' Book List (WWBL)....Thanks for the cranium's up. I've enjoyed the entire Dog Walker series and just read the first in the Vintage Murder series (won't be the last). I hadn't heard of the India Hayes book but since I agree on the other two, I'll definitely seek it out! Thanks for the great reviews! I haven't read any of these series so I now have more on my list. 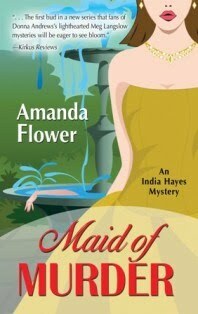 I bought and read Maid of Murder and enjoyed it. The characters and setting, as you said, are engaging and lots of fun. Can't wait for the next India mystery! Great reviews, Dru! I've read more cozy mysteries this year than ever before in my "reading career"! I'm going to keep my out for these.